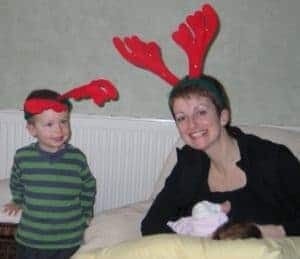 As the festive season approaches, women can sometimes feel pressured to get away from their baby and go out on their own. However, many mothers don’t feel like leaving their child, especially in the early months. Breastfed babies are very portable and you can take them with you to almost any place. If you go to stay with relatives explain what you’re comfortable with, as even young babies can sometimes be upset if they are passed around too much. If you normally share a bed with your baby, check the new sleeping arrangements for safety, making sure there are no dangerous gaps, saggy mattresses or too warm covers. LLL can offer accurate information about this: read our post on Safe Sleep and the Breastfed Baby here. If you need to travel with your baby, then breastmilk makes the best travel food. You don’t have to worry about taking feeding equipment as your milk will always be available if your baby gets tired or hungry, or your journey is delayed. If you are travelling by car and your baby gets fractious or is hungry you can find somewhere to stop and nurse. After parking some mothers have even found they manage to feed without taking the baby out of the car seat, but others enjoy a short cuddle break. When using public transport, a baby sling can be useful when getting on buses and trains, and can provide a discreet way to breastfeed. 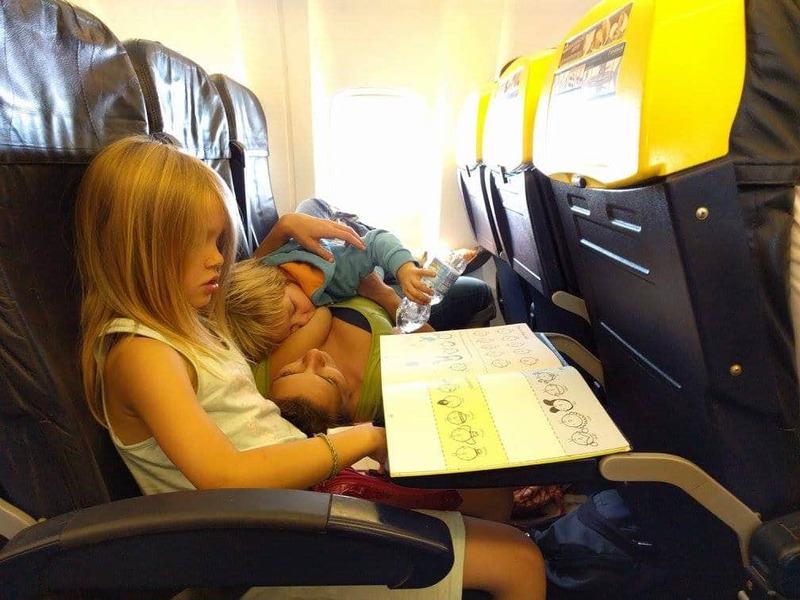 Breastfeeding has an added advantage when travelling by plane, as feeding during take-off and landing helps equalise the pressure in your baby’s ears. If you feel like you need some privacy and are travelling with another adult they might use a newspaper to create a screen between you and others. As long as you are complying with seatbelt rules, airlines should support a woman’s right to breastfeed. If a member of the crew objects you could ask them to check if this is the airline’s policy, pointing out that a crying baby will be far more upsetting than a happily nursing one. At this time of year many women find themselves facing extra work and activities. You may find yourself planning family gatherings and rushing around buying presents, cleaning, decorating the house and baking. If you have older children, there may well be concerts and shows to attend or extra parties to go to, or you may be making long shopping trips or going to office parties. Sometimes it seems easier to leave a breastfed baby at home with family or friends and a bottle of expressed milk. At family get-togethers you may find that others are eager to hold the baby and times when the baby might have breastfed are spread out. A mother can find she is rushing around looking after guests instead of sitting down and breastfeeding. 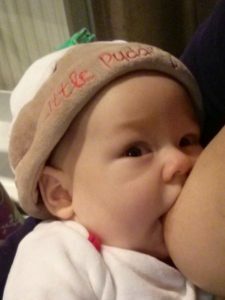 As a result, by the time the holidays are over, some women find that their milk production has declined due to decreased feeding and the baby may fuss at the breast. It may feel like you have “lost” your milk or the baby is weaning. A few days spent keeping the baby close to you and offering extra nursing time are usually what is needed to bring milk production back to normal. 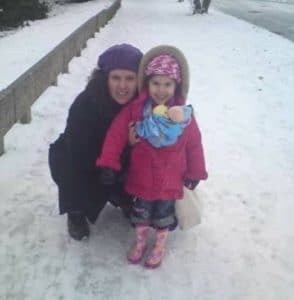 To avoid a possible drop in milk production you might consider taking your baby with you on shopping trips and to parties, or offering extra feeds when at home. 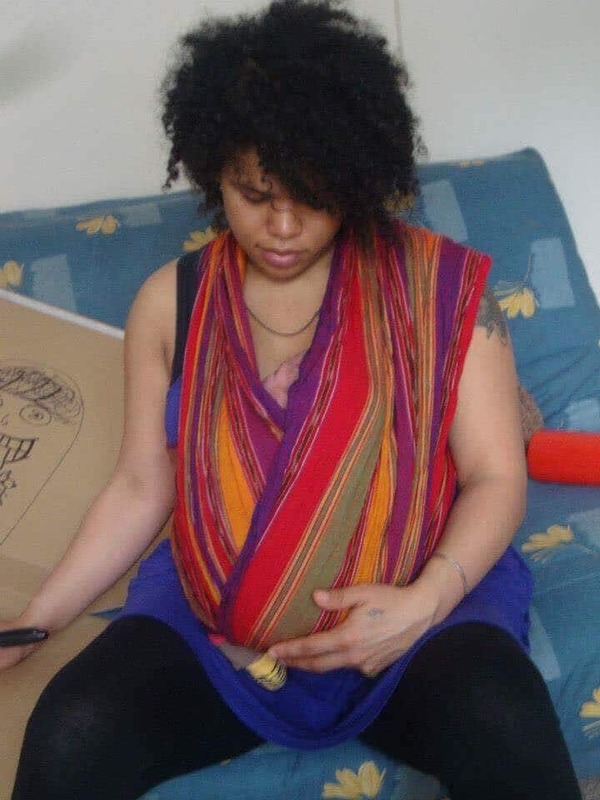 Wearing your baby in a sling or wrap makes it easy to nurse discreetly and is very useful when you have guests. It enables you to keep your baby from being passed from one person to the next and becoming overstimulated. It can be helpful to keep a list of things that need doing on the fridge and if someone offers to help you can suggest something. If you are having a party or family gathering, ask guests to bring food contributions instead of making all the meals yourself. 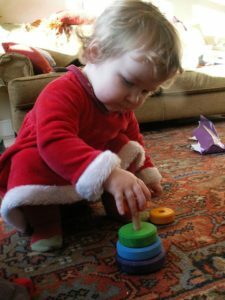 Longer intervals between feeds and some missed nursings may not seem significant, but holiday weaning can creep up and surprise you. It doesn’t just happen during the winter festivities; it can happen on holiday, around birthdays or other special events, and even when you’re moving. Whenever a baby and mother are busy and distracted, if there are visitors or a woman has to make a business trip, holiday weaning could occur. Being aware of it and trying to ensure that activities, attention from others and distractions don’t inadvertently lead to less feeds can help to avoid difficulties. Do certain foods need to be avoided? It is sometimes thought that if mothers eat foods that make her feel gassy, such as broccoli or cabbage, this will make the baby gassy. Gas from a mother’s intestinal tract cannot pass into her blood and deposit itself into the breast for her baby to drink, but some of the proteins from digested food do enter the blood and may then pass into a mother’s milk. Some babies may be sensitive to a particular protein and react with wind and fussiness. If a mother notices that her baby seems to have an obvious reaction every time she eats a certain food, then it can be useful to eliminate that food and see if things improve. On the whole, nursing mothers should feel free to eat whatever they like, as the majority of babies do not have any problems with food proteins. Read more about breastfeeding and food allergies and intolerances here. 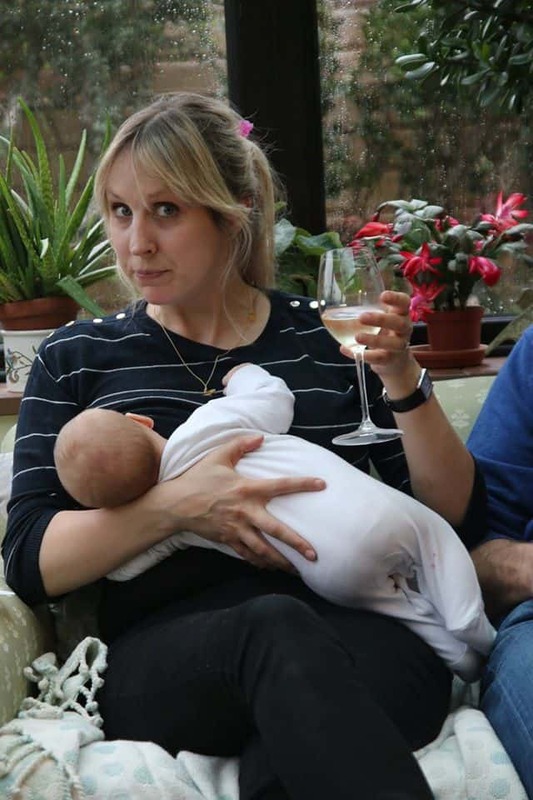 Breastfeeding mothers often receive conflicting advice about whether alcohol consumption can have an effect on their baby. The effects of alcohol on the breastfeeding baby are directly related to the amount the mother ingests. Present studies indicate that although significant amounts of alcohol are secreted into breastmilk it is not considered harmful to the infant if the amount and duration are limited. The baby’s age (newborns have immature livers and will be more affected while an older baby can metabolise alcohol more quickly), a mother’s weight (a heavier person metabolises alcohol more quickly), the amount of alcohol and whether it is taken with food (this decreases absorption into the blood stream) all need to be considered. Alcohol passes freely into mother’s milk and has been found to peak about 30 to 60 minutes after consumption, 60 to 90 minutes when taken with food. As alcohol leaves the bloodstream, it leaves breastmilk too. It takes a 120 pound woman about two to three hours to eliminate from her body the alcohol present in one serving of beer or wine; the more alcohol is consumed, the longer it takes for it to be eliminated. Since alcohol is not “trapped” in breastmilk (it returns to the bloodstream as mother’s blood alcohol level declines), pumping and dumping will not remove it or speed up elimination from the body. Neither will drinking a lot of water, resting or drinking coffee. 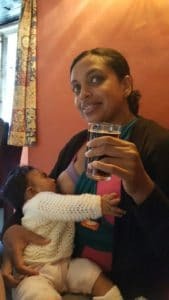 If a woman wants to minimise the alcohol her baby gets she can try nursing right before having a drink: milk will be alcohol-free again within two or three hours. Babies often seem to want to nurse more in the hours afterwards. A beer or a glass of wine a couple of times a week is unlikely to matter, and the effects decrease as your baby gets older, but a baby’s growth can be compromised if a woman drinks substantial amounts regularly. Mothers who are intoxicated should not breastfeed until they are completely sober, at which time most of the alcohol will have left the mother’s blood. If a woman wants to drink but is concerned about the effect on her baby, expressed breastmilk could be stored to use for the occasion. It may be necessary to express for comfort during the hours she is not feeding, discarding the milk. In the past, beer has been found to help a milk supply, but it is likely that the polysaccharide from barley may be the prolactin-stimulating component of beer so non-alcoholic beer is equally effective.7 Read more about breastfeeding and alcohol here. 7 Marks V, Wright JW. : “Endocrinological and metabolic effects of alcohol”, Proc R Soc Med 1977; 70(5):337-344. De Rosa G. et al. :”Prolactin secretion after beer”, Lancet 1982; 2(8252):934. Carolson HE et al. : “Beer-induced prolactin secretion: a clinical and laboratory study of the role of salsolinol.”, J Clin Endocrinol Metab 1985; 60(4):673-677. 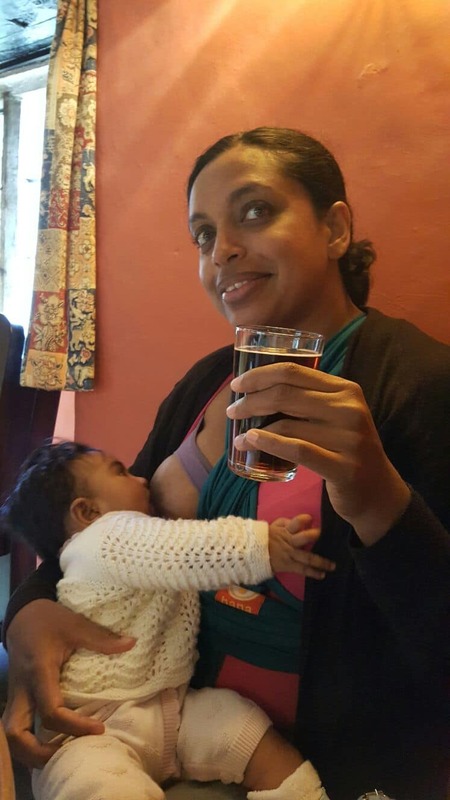 Koletzko B, Lehner F.: “Beer and breastfeeding”, Adv Exp Med Biol 2000; 478:23-28.